Celebrate spring, family and friends with this easy brunch menu. Bright morning sunshine streams in through the windows. The dog scoots over to bask lazily in the warm light. Kids, still in pajamas, race around the house and out into the gardens where the bulbs are going crazy—tulips in every color line the patio. Brunch is a wonderfully informal way to gather family and friends on a warm weekend morning in spring. We barely need an excuse to throw together a brunch this time of year, but if you must have one, Mother’s Day, Father’s Day, graduations and showers all work well. Part elaborate breakfast and part hearty lunch, brunch is typically late in the morning, which means it’s a perfect chance to include kids with no worry about bedtimes or babysitters. We’ve created a feast of easy recipes—many are make-ahead—that emphasize the soft colors and vibrant flavors of spring. Our menu has plenty of what you might expect in a brunch, such as eggs and sweet baked goods, but we managed to lighten it all up. After all, it just doesn’t seem right to kick off this season of renewal with a heavy meal. Begin the festivities with a pretty pink drink. Ours is based on two favorite juices—grapefruit and pomegranate—and laced with an optional splash of Campari. With or without the alcohol, the juices are tasty and good for us. Grapefruit is a good source of vitamin C, and pomegranate juice—a relative newcomer in many drink arsenals—is highly touted for its antioxidants. The main dish is a comforting casserole of eggs nestled into creamy cheesy polenta baked with crumbled sausage on top. 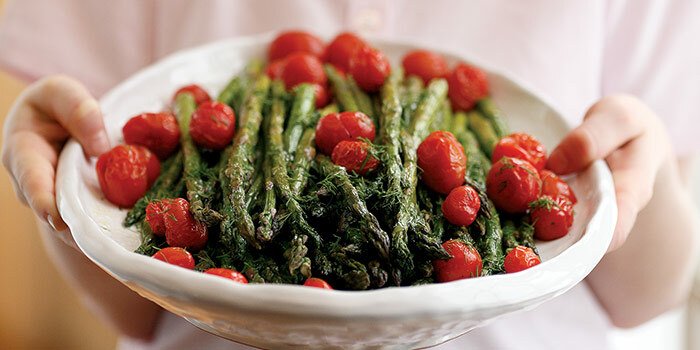 The side dish of roasted asparagus and tomatoes is the essence of simplicity. Inherently healthful, the bright green asparagus sings spring while the tomatoes add a welcome burst of color and flavor. Our recipe for Cardamom-Crumb Coffee Cake has been tweaked to improve its nutrition profile without sacrificing flavor. Oats add crunchy texture and fiber. And we substituted oil for part of the butter to keep the crumb irresistibly tender without adding too much saturated fat. Dessert is a fat-free variation on the classic Baked Alaska, without the ice cream. Here the splendid combo of rosy pink rhubarb and bright red strawberries is gently oven-poached to delicate perfection with a smidgen of grated fresh ginger. The Alaska part of the equation is a puff of cloudlike meringue baked until its shiny peaks are a soft golden brown. By now, we hope we have made you hungry. Hungry enough to stop in your tracks and take the time to celebrate the beauty of a bright morning in spring. —Award-winning cookbook author Marie Simmons’s latest book is Sur La Table’s Things Cooks Love: Implements. Ingredients. Recipes.